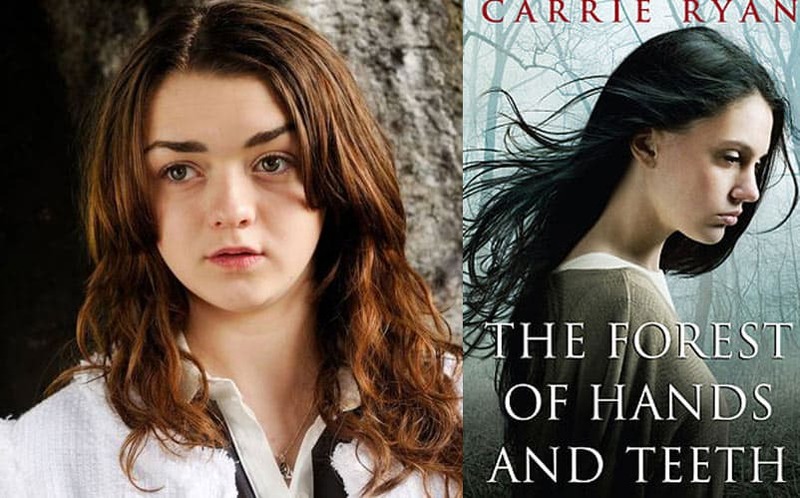 Maisie Williams to Star in Forest Of Hands and Teeth Movie | Nerd Much? Actress Kate Maberly is set to direct The Forest of Hands and Teeth movie, which will be adapted from the Carrie Ryan New York Times best-selling novel of the same name. And, the movie already has its leading actress in Game of Thrones star Maisie Williams, according to Deadline. The book follows Mary (Williams), who is one of the many survivors of a bloodthirsty virus that turns the infected into unconsecrated cannibals (basically, zombies). The story opens on an unexplained disaster that has already turned a lot of humans into zombies. As they roam the forest of Mary’s settlement, they try to get inside the barricaded walls. But, the village isn’t exactly a safe haven, as it is a dystopian society marked by violence and secrecy. The book is the first volume of a trilogy, so it’s likely that the movie will also become a series. Especially given the star power of Maisie Williams, and the fact that, well, everyone loves zombie movies, it looks like this could become a popular series. Funding for the film is still being sought, so it’s very early on the production. Still, we’ll be sure to add it to our list of all of the upcoming zombie movies.